The SmartMax Tachometer Module integrates a 16 character LCD readout and key pad. In normal operation the Control Module provides a high accuracy readout of the current engine RPM and at the press of a key the Max. RPM values for the last run are recalled. Using the keypad, the SmartMax RPM & Peak RPM for the last run can be displayed on the LCD. Max RPM values for the previous 3 saved runs can also be recalled at the press of a key. The system can be programmed with 6 different configuration profiles to allow the user to quickly change between different vehicle or driver setups. As the settings are stored in non volatile memory, the system will not lose its configuration profiles or Telltale readings when power is removed. The profiles and readings can therefore be changed or reviewed with the unit removed from the vehicle if required. The Shiftlight and Tachometer Modules are designed to be fixed into the vehicle using "Dual Lock" * (supplied) and can be easily removed and refitted as often as required. The Satellite Shiftlight Module should be positioned in the drivers field of vision and its pre-terminated lead connected into the Tachometer Module. The lead has a pre-fitted rubber grommet so that if it is fed through a bulkhead the hole can be correctly plugged. An example of robustness, the above unit had earlier broken free of its mounting and was dragged by its cables down the track at racing speeds! The unit still functioned fine and no repair was necessary. A pre-terminated power loom is supplied which is simply hooked up to a 12V supply, a good ground point and a coil negative or tacho output; and connects into the Tachometer Module. 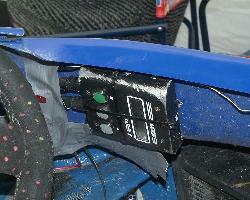 Note: Although this system is designed for use in a racing environment, the control module should be installed so that it is not exposed to direct water spray.